Detective John Benthien just wanted to spend some leisure time in his captain’s house on the island of Sylt, when one October morning the peacefulness is suddenly destroyed. Two twin boys were killed near his house. Was it an accident or a murder? Benthien starts to investigate but soon another body is discovered, and an intense search starts. Will Benthien find the murder, or will more people have to die? 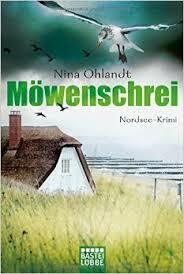 The continuing popularity that regional whodunits enjoy at home and abroad turn Seabord Murders and The Cry of the Seagull into perfect choices for all readers of Nele Neuhaus, Volker Klüpfel & Michael Kobr. The author: Nina Ohlandt was born in Wuppertal, raised in Karlsruhe and trained as a language teacher in Paris while she wrote her first children’s book. Later she worked as a translator, language teacher and market researcher, until she found her way back to her true calling: writing crime novels taking place in the land of her ancestors, the so-called country between the seas.